Learn more about opportunities for schools interested a special outreach presentation prior to hiking Mount Major by contacting Education Director, Dave Anderson. The outreach volunteer stationed at the main trailhead parking lot at Mt. Major related a scene from last year: two yellow school buses arrived to disgorge a huge gaggle of nearly 100 excited fourth graders. Some 25 parent chaperones from Portsmouth followed in private vehicles. The students raced up and down the mountain. Chaperones descended a little more slowly. All had a great time climbing rocks, getting fresh air and exercise. We then heard a suggestion that as the Forest Society becomes a key landowner hosting segments of the most popular trails on Mt. Major, perhaps we might provide education resources for schools with existing school traditions of climbing the peak. This inquiry led us to the Little Harbour Elementary School in Portsmouth, where we met P.E. teacher Sean McGrimley. Sean organizes a school hike at Mt. Major for four fourth grade classes as an annual LHS tradition. We asked if LHS students would be willing to share their Mt. Major experiences. What had they liked? Disliked? What had they wondered about? The idea for a new pilot education program was born! Fast-forward to this past September. I visited LHS on a Wednesday afternoon with an introductory presentation designed for students about what to look for and what to expect from their upcoming hike including prominent features along the Main Trail, forest types, examples of wildlife, geology, land use history and hiker etiquette and basic safety. That same evening, I met with two dozen parent chaperones to share the same information and news of the land conservation campaign by the Forest Society and Lakes Region Conservation Trust, culminating in acquisition of four tracts in the Belknap Range, including two on Mt. Major. The following Friday brought perfect weather. We joined students, parents and staff for their hike. Retired P.E. teacher Steve Schulten, who established the LHS tradition, returned to accompany his successor and former colleagues. The mountain itself did most of the teaching that day. Students knew more about what to look for regarding the natural and cultural history of Mt. Major. As they climbed, they proudly pointed out landmarks – blazes, carved initials in beech bark, stonewalls, USGS benchmarks and Mr. Phippen’s hut at the summit. Some students documented the hike with cellphone photos, collecting selfies and images from the pre-hike presentation in an impromptu scavenger hunt! The summit group photo is another LHS tradition. The photo is displayed in large format on the gym wall. We’re learning from the experience of working with Little Harbour School just as they’re learning more about the mountain from us through this unique partnership. 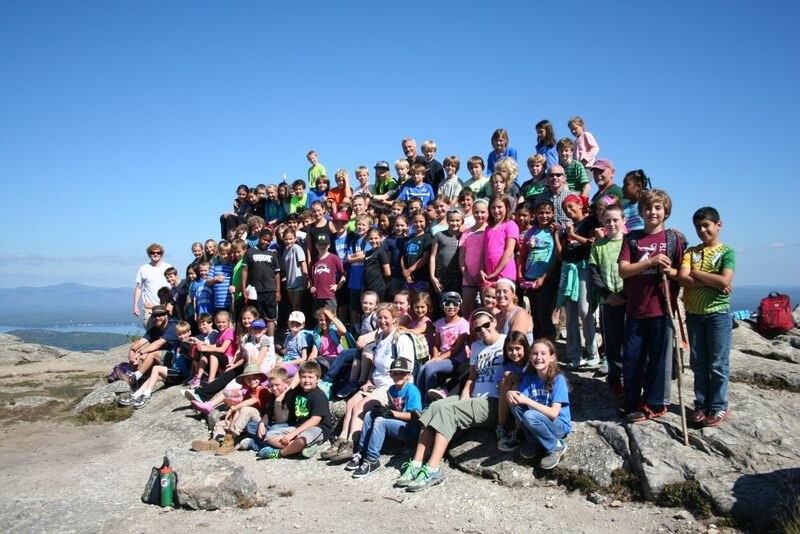 Ideally, we’ll endeavor to expand to reach other New Hampshire schools with hiking traditions at Mt. Major… or perhaps elsewhere. It’s not impossible to imagine expanding this school outreach to other mountains where the Forest Society has a significant land conservation history and now owns portions of popular hiking trails. The experience of sharing a perfect September day with a vibrant community of faculty, parents and students – quite possibly the future of land conservation leadership - puts land conservation work in context. Ultimately where today’s land conservation efforts will matter most: the future. Group photo - Forest Society staff and Belknap Range Conservation Coalition volunteers and students at the Mount Major trailhead.